Medical plant jamur kayu or(Ganoderma lucidum (Leyss.ex Fr.) Karst. )for the botanical name grow on decaying wood, grows wild and sometimes cultivated. Agency long-stemmed fruit that grows straight up, his hat from the body attached to the stalk, get up a half circle and grows horizontally. 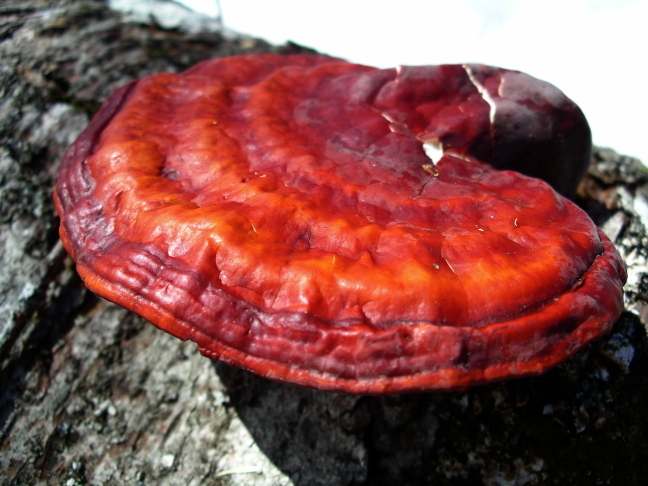 Fruiting body shows circles which is the period of growth, wavy or curved edges, the upper side with the folds radier, purplish-red color of brown, polished like lacquer. Several years with each time to form a layer of new himenofora. CHEMICAL CONTENT:. Ergosterol, coumarin, fungal lysozyme, acid protease, water-soluble proteins, amino acids, and polypeptidase saccharida, as well as some types of minerals such as sodium (Na), calcium (Ca), zinc (Zn), copper (Co) and manganese (Mn).